I am looking forward to 2013. This will be the year I get all of this medical stuff figured out. I am determined. Overall I am feeling better, but I am still far from feeling like myself. I don’t really remember what normal was, but I know this isn’t it. I know you aren’t supposed to wake up tired, or wake up 5-6 times a night. You shouldn’t get tired from doing things like standing up to cook, or get muscle fatigue lasting for days from it. I won’t even go into some of the more personal things, trust me, they aren’t pleasant. I also know now that opening things that look like bills on Christmas is a really really bad idea. I wound up in tears, because I opened a surprise medical bill which was quite large 😦 Especially frustrating, when the billed tests didn’t result in progress. I had my last Dr. appointment the Wednesday before Christmas (next one isn’t until Feb or March). My levels are still all over the place. Thyroid is getting better, but still not ideal. I took a series of new tests this week, also not covered by insurance, because I really want to see the condition of my adrenals. It’s likely they are fatigued or damaged and may be the reason i’m not making the progress I should be. If the adrenals aren’t addressed, it hinders everything else. I am not jumping ahead, but if the adrenals are not in good shape, that means drastic changes in my lifestyle. It won’t be easy, but I am willing to do anything to get back to my old self! I am hoping if it comes down to it, the determination and drive I have to be healthier will enable me to be strong. Hoping I get the results from the tests in the next week, so I can wrap my mind around whatever needs to be done. So in the meantime, i’ve been trying to de-stress and relax more. More time reading, more time trying to not worry about work (my new position is pretty intense), trying to add more sleep (which is hard when you don’t stay asleep), and add more low key workouts in. Another installment of Fun Facts Friday! I can’t stand trash in my car. I put everything in my cupholder if it fits and I must get rid of it immediately. If I’m on a roadtrip, you better believe there is a trash bag and it gets dumped whenever possible. I hate eating in the car and I try not to. I hate food smells in my car and I am not a fan of eating on the road. When I first got my car, Dan borrowed it and ate 2 am Whataburger in it. I just about flipped out the next morning when my car smelled like fries. I keep emergency snacks in my glove compartment and my purse. I can’t stand too many emails in my inbox. I either delete them or put them in folders, unless I need them right away. Dan got me hooked on Adam Carolla’s podcast. I listened to all of the ones I could download (been working on them since October). I am now in real time and was sad when I didn’t have any more to listen to. Good thing they put them out almost every day! I’ve been listening to them in the car and when working out. He also got me addicted to Duck Dynasty. I’m usually pretty good about not watching whatever reality tv everyone gets sucked into. I thought, this has to be the stupidest idea for a tv show ever! I was wrong, I really like it. Plus I like that they show good values and prayer in their show. That’s something you don’t really see. Last Wednesday I finally caved and got an iphone. I started with a Blackberry, then an Android, now the iphone 5. So far, so good. Any must have apps? About 6 months ago Dan and I went to the library and got library cards. He just wanted one, so he could then get one in the city where he works, so eventually he could take his school tests with their proctor. I wanted one because I wanted to start reading again. Other than the book I read in Hawaii in April, I don’t think I’d read a book for YEARS. I think the last time I actively read was when Dan was living out of state and I was reading in airports and on planes. Granted, I still haven’t gotten back into the habit like I used to, but I am working on it. Not only is it a good habit to have, but I also need to work on stress relief for my medical and work issues, which don’t help things. I don’t have a ton of spare time, but when I do, I want to fill it more with productivity and less with crap tv. So every other Sunday, I go get a new book from the library. Our library has long hours and is open 7 days a week! How awesome is that? It may be small, but it has a large new release and best sellers section, which is where I’ve been migrating to. It’s been a bit hit or miss with the books I’ve picked out. Eat and Run-Scott Jurek. I wasn’t sure i’d like a book about running, i’ve never really read running books or cared to. LOVED this book. I am sad I missed him when he was in town earlier this month. In 50 years we’ll all be Chicks-Adam Carolla. Loved this. This was even before I followed his podcasts regularly. I seriously laughed out loud reading this. St. Nick brought Dan the newest installment from Carolla, Not Taco Bell Material, which I will read when he’s done. I ALMOST read it before St. Nick wrapped it up. The Bridge-Karen Kingsbury. Ok. Kind of slow, but it wasn’t bad. Seating Arrangements-Maggie Shipstead. Liked this one, it was a decent read. Most Talkative -Andy Cohen. What I read, I liked. I got busy and didn’t finish it. When I went to recheck the book, someone else had it reserved and I haven’t seen it at the library since. Currently reading: A Gift of Hope-Danielle Steel. This is a new one I started yesterday. It’s non-fiction about helping the homeless. A little shopping. Not really for gifts, just because I felt like it (weird, I am not really a shopper for no reason). I went to Bass Pro AND Cabela’s (2x) in one week. I did pick up some fun spice packets and a gun cleaning kit for dad. One of these days I will actually look around the whole store at both places. Christmas isn’t really the best time to leisurely explore a mega-store. The decor alone is enough to take half a day to look at! A little cooking. Ok, a lot of cooking. I love to cook for my parents. Unfortunately, braising liquid from some ribs poured down my arm and gave me a really big and severe burn on Sunday afternoon. It’s really big and ugly 😦 I sent Dan and my BFF actual photos. I will spare you that. Neither of them were amused. Like my Astros pjs? (I am blocking the star on accident) Dan bought me those a long time ago in the Houston airport on a trip home to see me. Back then the Astros weren’t near as bad. Eh, I still love the pj’s and my baseball. A little time in the country. You know, looking for pregnant cows for 2 hours with your dad, hunting, and making sausage. Simple country folk things. My parents don’t even live in the country, but it’s pretty darn close to their house. Tamales. It’s whats for Christmas Eve dinner…always. I used to think it was a south Texas thing, but my friend Alison pointed out it’s a Tex-Mex influence thing (she’s from El Paso and they do tamales and chalupas). So it’s a regional thing I guess. Mom buys hers from Central Market, gluten and lard free. I’m weird and this year I crumbled mine over blue corn chips and ate them like nachos with queso and guacamole. Dang I wish I had a Central Market closer to me. Gift pelicans. Why? Because my parents are trying to sell their house and I told my mom not to bother with a tree this year. Instead I decided they needed to be around the pelican in their nautical themed living room. Hence the gift pelican. If you listen to Adam Corolla podcast, the pelican thing is even funnier. Yes, a few months ago Dan got me hooked on his man-crush, Adam Corolla, and now I am addicted. I LOVE him. I hope he comes to Texas again soon, because I’d love to see him live. I loved him on Loveline and the Man Show, but his podcast is awesome. It’s definitely not for everyone, but most days I swear he takes thoughts straight from my head. Spent hours on Christmas day trying to teach my mom how to use an itouch. If you’ve never met my mom, she has talons for fingernails. This does not bode well for itouch. This may be the deal breaker on an iphone for her. No matter how she tried to tap the screen, she kept having issues. Sometimes you get something you need exactly when you need it. For me, it was a change of pace. A change of scenery. A change in people. -Took my pregnant BFF to finish her Christmas shopping on Friday. It made my week to see her. Plus we completed her gift list and spent good quality time together. -I had off on Friday. I worked only about 30 minutes, and that’s because people wouldn’t quit texting me. I didn’t use the work iphone but once to look at a few emails. Working 0 would have been ideal, but some of my coworkers apparently didn’t get the memo to not bother me. -I went hunting with my dad on Saturday. Afterwards got to hang out with some of his old fire department friends at the bunkhouse, which was nice. Met a couple of new people too, younger guys from the department that hunt around there. -Made sausage with mom, dad, and a family friend on Sunday morning. Making sausage is something we’ve always done at least annually in our family since the beginning of time (hello, we are small town Texas!). I haven’t participated since high school, because I’ve not been around. This was my dad’s 2nd time this year and we had a great time. -I went to church twice in 2 days. Once on Sunday, once on Christmas eve. Lots of time to think and things to think about. -Dad and I went to feed our neighbor’s cows on Saturday and got to see a brand new baby calf. We searched for another cow that was expecting for 2 hours and never found her that day. Apparently she was having the baby somewhere, so there are 2 new baby cows! -I ran Sunday-Tuesday at home. Not terribly exciting but it was different. Nice to run asphalt and not worry about traffic. I just wish my muscles weren’t bothering me. -I photographed some of my old family photos with my new phone. Looking at the old stuff really made me smile. -Good family time. Wish my sister had been around, but she is off in NM with her BF. It was nice to just enjoy each other’s company and the time off. I’m back home now. Perfect drive home, no traffic and no dumb drivers! When I got out of the car, the temperature had dropped 30 degrees. Finally got cold weather for Christmas, even if it did come at the end of the day! I will first say, had I been not letting work rule my life, this race would have been a lot easier. 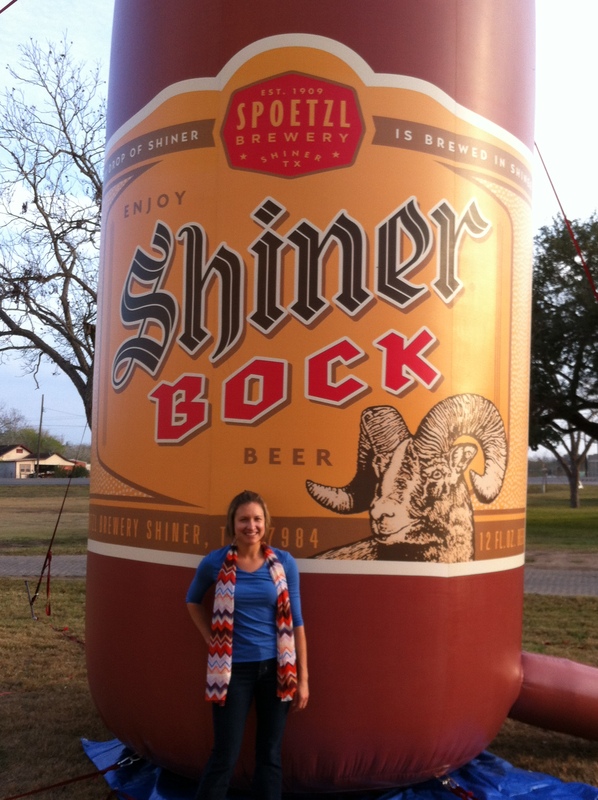 We left for Shiner on Saturday afternoon. Headed straight to packet pick-up at the Brewery. Then to the hotel, got settled in and ready for dinner. Back to Shiner to eat at Werners. It may be a good restaurant, but it wasn’t on Saturday night. We have 2 overcooked steaks, burnt appetizers, and dry chicken. Plus they were out of sweet potatoes and ranch dressing (which made half our table very sad). We still had a great time, even if the food wasn’t great. After dinner, we headed to Buccee’s to get beer and dessert. Since i’m a old lady, I went back to the room to finish my book and try to wind down. Unfortunately I did not wind down. Then around midnight I couldn’t stop scratching! Either I had an allergic reaction to something in the bed or something was biting me. I had to take Nyquil to knock myself out to get sleep, which I hate to do. I actually slept later than I usually do. Got dressed and headed to the lobby for breakfast, then loaded up in the car and headed to Shiner. The start was crowded. Narrow street with 500 5K people and 1000 half marathoners. We barely made it through the massive portapotty lines before the start! The first mile was pretty congested. I tried not to waste too much energy bobbing and weaving. The course was ok, I didn’t mind it, but it wasn’t terribly scenic. Beginning and end were at the brewery, miles surrounding those were residential. The bulk of the race was really rural, including a mile of unpaved road with big rocks (so not used to that!). It was definitely not flat. It was pretty warm and very humid. Luckily the sun went away, or we’d probably fared much worse. Everyone finished in once piece 🙂 Jenn completed her first half, YAY! Dan didn’t get there in time for my finish 😦 How many halves have I run? He’s never seen me finish a half. The ones he did attend, he didn’t make in time. HUMPF. I even finished exactly at 10:20 am like I said I would. My time was ok. I knew it wouldn’t be a PR, it was too warm and I’m not trained up for it. I am happy with what it was for the conditions and having run last weekend too. A little bitter I didn’t win an age group beer stein, just because they were so cool! Good weekend, although it seemed really short. 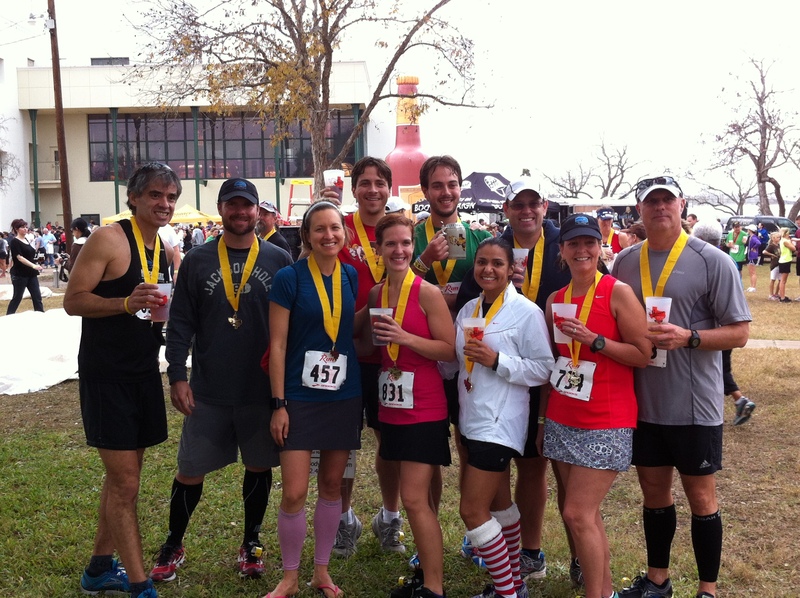 It was my first time to do an out of town race with a group and we had so much fun! I think Dan even had fun with people he didn’t know 🙂 I can’t wait for the next one!